BREAKING: FC Basel set to become owners of Chennai City FC. The top Swiss club is set to acquire stakes at the club. Coimbatore: I-league outfit Chennai City FC is all set to see a major breakthrough as the club is set to see one of the biggest clubs of Switzerland, FC Basel, become the owners of the club. The Swiss club is reportedly set to invest 15 million Euros in the club and besides this, there will be an exchange of coaching facilities and players between the two sides. With the top European outfit as their owners, Chennai City FC is also reportedly set to change their name and bid for an Indian Super League spot from Coimbatore. 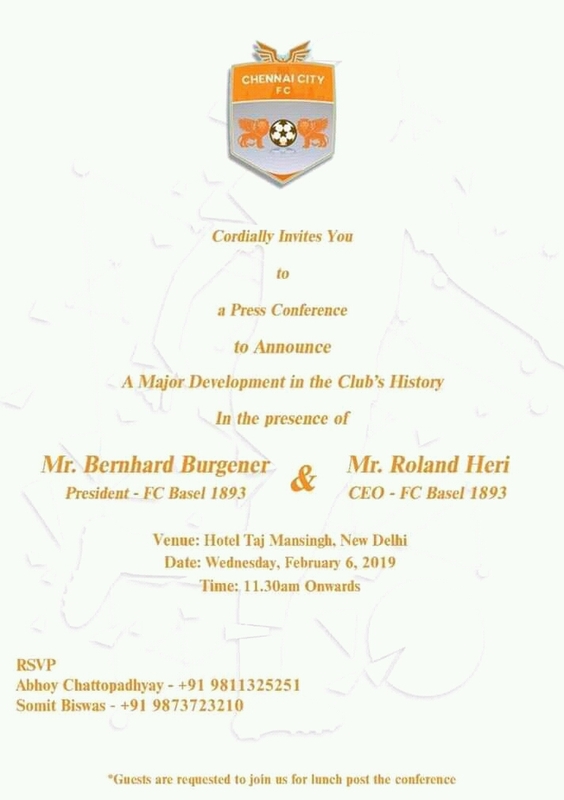 The official announcement of the new ownership will take place at a press conference with FC Basel President Bernhard Burgener and Managing Director Roland Heri in New Dehli on February 6. Senior AIFF officials including president Mr Praful Patel and general secretary Mr Kushal Das may also be present as guests at the event. FC Basel is one of the most successful clubs in Switzerland with 20 domestic titles to their name.